A new study led by Yale University reveals a cluster of young stars that develop in distinct, episodic spurts. It is the first time astronomers have seen such a growth pattern within a star cluster — a chaotic, turbulent environment that is common for star formation. Previous observations have focused on stars forming in more isolated regions of space. In a study published this week in the journal Nature, astronomers described the cosmic convulsions within Serpens South, a star cluster 1,400 light years from Earth. The researchers focused in particular on a protostar called CARMA-7. The researchers recorded 22 “episodes” in which CARMA-7 experienced the gravitational push-pull that characterizes star formation. 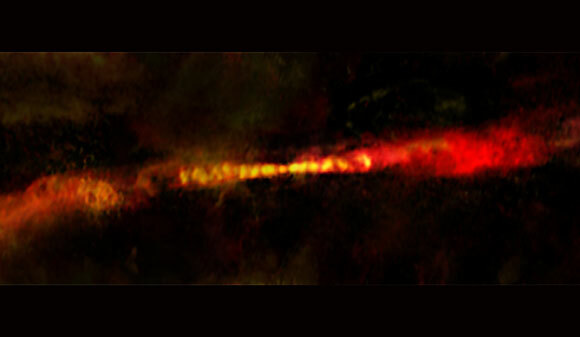 As protostars ingest raw material, they have counter-balancing emissions of material they don’t need. Such “outflow” is important to researchers because it can be measured more easily, unlike the hard-to-detect incoming matter. The first author of the paper is Adele Plunkett, a recent Yale graduate student now working with the European Southern Observatory (ESO) in Santiago, Chile. Plunkett and her colleagues used data from the Atacama Large Millimeter/sub-millimeter Array (ALMA) in Chile to conduct the research. Plunkett said the technology allows researchers to determine details about the star formation process, such as how often material is accreted or ejected, on time scales of a few hundred years. Further observation promises an even greater level of detail about protostars in their most common environment, said the researchers. The other co-authors of the paper are Diego Mardones of the Universidad de Chile, Michael Dunham of the Harvard-Smithsonian Center for Astrophysics, Manuel Fernández-López of Instituto Argentino de Radioastronomía, and José Gallardo and Stuartt Corder of the Joint ALMA Observatory. 1 Comment on "ALMA Views the Episodic Outflow of Protostar CARMA-7"
This sounds more like the birth of a Black Hole than a protostar.